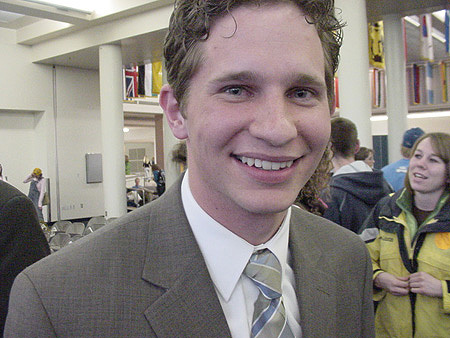 March 9, 2006 | After a long, strenuous campaign Quinn Millet stepped down from his position and Noah Riley, followed by loud cheers, took his place in the ASUSU presidential office. "I'm speechless. I'm just trying to take it in right now," Riley said. Riley, who defeated Cam Lee, said he felt honored to be elected and gave a heartfelt thanks to all of his supporters while making a promise to try further involving and representing the students who chose not to vote in the ASUSU elections. "I hope this is a true representation of the student body. I want to make sure they (the student body) see the benefits of these results," Riley said. Millet said he felt good with the results and felt especially good giving up his position to the candidate who was chosen. "Noah will do an outstanding job," Millet said. Ag Senator: Election ended in a tie. Logan Ibson won with "tails" in a coin toss.